DÉDERIX, Sylviane. Capturing the Dynamics of Minoan Mortuary Space in South Central Crete In:: Minoan Archaeology: Perspectives for the 21st Century [Online]. Louvain-la-Neuve: Presses universitaires de Louvain, 2015 (Erstellungsdatum: 26 avril 2019). Online verfügbar: <http://books.openedition.org/pucl/3019>. ISBN: 9782875585394. Déderix, Sylviane. “Capturing the Dynamics of Minoan Mortuary Space in South Central Crete”. 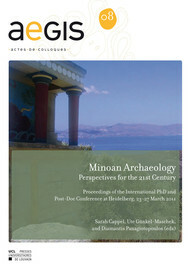 Cappel, Sarah, et al.. Minoan Archaeology: Perspectives for the 21st Century. Louvain-la-Neuve: Presses universitaires de Louvain, 2015. (pp. 61-75) Web. <http://books.openedition.org/pucl/3019>. CAPPEL, Sarah (Hrsg.) ; GÜNKEL-MASCHEK, Ute (Hrsg.) ; und PANAGIOTOPOULOS, Diamantis (Hrsg.). Minoan Archaeology: Perspectives for the 21st Century. Neuauflage [Online]. Louvain-la-Neuve: Presses universitaires de Louvain, 2015 (Erstellungsdatum: 26 avril 2019). Online verfügbar: <http://books.openedition.org/pucl/2999>. ISBN: 9782875585394.